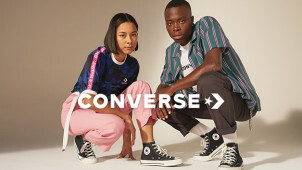 2019 New Arrivals from £20 at Converse - Includes Footwear and Clothing! Converse is a brand with a surprisingly long and rich history, and while since the '90s the name has been largely associated with skater culture and casual, American style, it was first popularised as the main manufacturer of basketball shoes. As other brands like Nike, Puma and Reebok entered the market, Converse's monopoly on sports shoes was lost, however, thanks to their iconic style converse shoes were reborn as a casual fashion staple, which has never really gone out of style. Converse shoes tend to stick to a few basic designs in terms of shape, but when it comes to the outer look there have been special editions featuring everything from DC comics characters to designs inspired by Pink Floyd and Nirvana. Shop with Converse and as well as comfortable, fashionable trainers, you'll also discover shorts, tees, shirts and hoodies for both men and women. With kids ranges too in both shoes and clothing, there's nothing that Converse can't conquer. How do I use my Converse discount code? Enter your discount code in the appropriate field when you place your order and if no code was given for the offer, the deal should be applied automatically before the amount you have to pay is calculated. Enjoy saving money on your new gear from Converse! Never miss a beat with the Converse newsletter. When you sign up you'll get access to exclusive events and offers as well as product launches - with 15% off your next purchase too - this is a really sweet deal. Does Converse offer free delivery? Save money when you place an order for new Converse trainers or other great Converse gear by using their standard delivery, which is free for orders of £50 or more. What sizes do Converse sell their trainers in? There is some variance between different trainers in the Converse range, however, most classic styles such as the All Stars are unisex and suitable for adults and kids, so come in a wide range of UK sizes ranging from size 3 for children up to size 13 for men, with every size and half size in between. They offer a size guide on their website for each shoe design to help you check you are getting the right fit. As well as the huge range of designs you can find applied to classic Converse shapes like the hi-top Chuck Taylors, Converse also offer you the chance to design your own custom trainer by picking fabrics, colours and design elements to use to make the perfect shoes for you. When is the Converse Sale? Like all retailers, Converse don't make their sale dates regularly available, but if you go online Converse have a permanent Sale page in all departments with clearance items. Alternatively, you can add Converse to your favourites on vouchercloud and we'll notify you when a new sale pops up. Converse offer a 30-day returns policy. If you wish to receive a refund or exchange, fill out the returns form and post it back with your purchase in the box with the provided returns label. Converse is one of the most iconic brands for casual and sports shoes of the past century. If you love the laid-back, all-American style of Converse, look out for a Converse discount code to save money on this much sought-after brand. With their most famous style of shoe, the Chuck Taylor All Star (known fondly just as 'Chucks' by many of its fans) largely unchanged in terms of its visual look since it was first created in the 1920's, Converse shoes never go out of fashion, making it the perfect investment for your closet this year. Although most Converse fans are very familiar with the Chuck Taylor name, not many people know who he actually was, or why the shoes are named after him. Chuck Taylor was a basketball player and coach in the 1920s and '30s who played for a team sponsored by Converse at the time. When he taught high school and college basketball players, he often promoted the All Star shoes and worked with the brand to make modifications to improve how it looked and felt. Converse honoured him by naming the product after him, a name which has stuck to this day. The classic converse sneakers is what it's all about for us. So what better way to get your kicks than to customise your own? With Customize by Converse you can start with a blank canvas, high or low top - with a Converse promo code you can go wild with colours, materials, prints and logos for less. The perfect way to stand out from the crowd, add these classics to your wardrobe for a timeless look that's always on trend.